My folding bicycle has these metal pedals. To provide grip they have some pointy bits that have stabbed me in the chins several times, bruising and bleeding me. I have learned to be super careful around them, but for a bicycle that is lifted up moving stairs, in crowded train, elevators and inside buildings, something less pointy would be nice. The axles were getting rusty and the lack of reflectors made it technically not street legal for night riding. One of the pedals had already lost a screw a few months ago. I tightened the others with some threadlocker, but the missing screw eventually turned out to be rather essential, as a crack formed above the one screw that was still in place. Not much later the metal broke completely, and was dangling dangerously. Finally a good enough reason to replace these damned things. I put some tie wraps on to keep it together while waiting for the new pedals. The fact that this stabby pedal is held together with tie wraps is a good enough excuse to replace it. What too choose as a replacement? I have kind of a blue theme going on with my folding bicycle, so it would be nice if the pedals would match that. The choices of blue pedals are rather limited. The few that I could find were still wide and fat meant for BMX bicycles, and of questionable quality. While for my folding bicycle I am going for a more slim look. 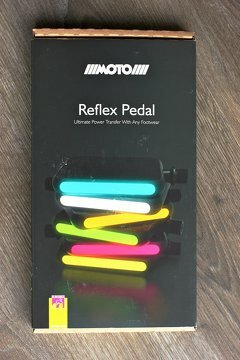 When I saw the Moto Reflex pedals I was instantly sold. That's exactly what a modern platform pedal should look like. 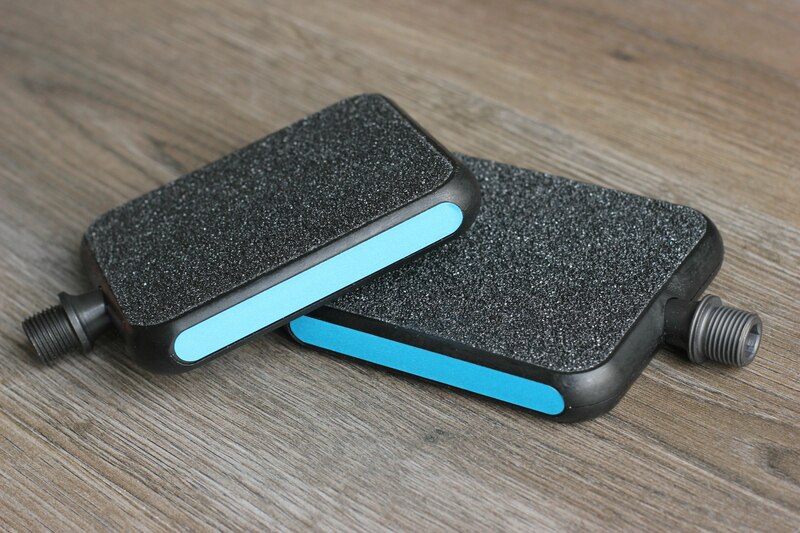 A large surface area to provide grip, built in reflection, and as thin as possible for added comfort, and best of all, rounded edges made out of plastic that will not stab anything. As a bonus it is also user serviceable. The Moto Reflex pedals with blue reflective strips. The platform is made out of plastic, softer and theoretically more fragile than metal, but I already have good experiences with the plastic Shimano PD-T420, which have held up for several years already without problems. What concerned me was that the Moto Reflex pedals don't have ball bearings. The cheapest pedals don't have them, and I tend o avoid pedals without them. But there are some high quality pedals that use bushings too. I can also see the appeal of a simpler construction with less maintenance and a thinner platform. The only problem is the price. The manufacturer sells them for 55 euros, with is quite hefty for some plastic pedals with simple bushings and some reflective tape. They are made in small quantities in Germany, the original Moto Urban pedal is made out of laminated wood and sell for 155 euros. 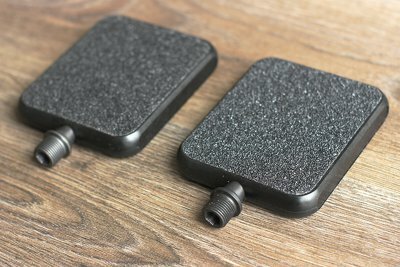 So in the world of German produced pedals these are a steal. I still begrudgingly paid a little over 40 euros for my pair. The pedals come in a nice cardboard box. No plastic. The pedals were either didn't really stay in place very well. besides the pedals there is sheet with pre cut reflective strips, in my case blue, a 3 mm hex key, an instructions on a folded sheet of paper, and an orange piece of paper urging the the customer to follow the instructions. Although orange is officially the only color allowed for reflectors on pedals I doubt if I ever get in trouble for that. 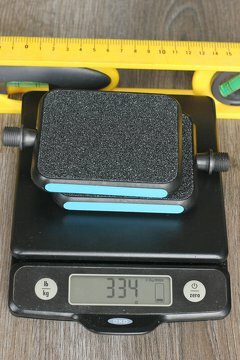 I measured the pedals to be 100 mm wide, 84 mm long and 17 mm thick. 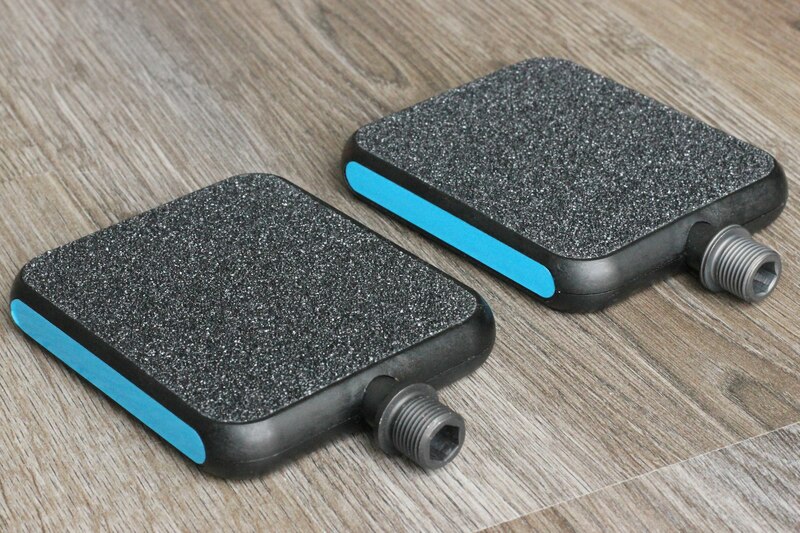 This give them a significantly larger surface, yet thinner than most other platform pedals. The pedals inside the packaging with the reflective strips and instructions above them. The pedals themselves come assembled, but still need to have the reflective strips installed, which are basically stickers. While putting on the stickers it is noticeable that the plastic molding is not as exact on the outside I expected. The pedals are quite stiff to turn, but according to the manual this will get better after they have been used for a while. 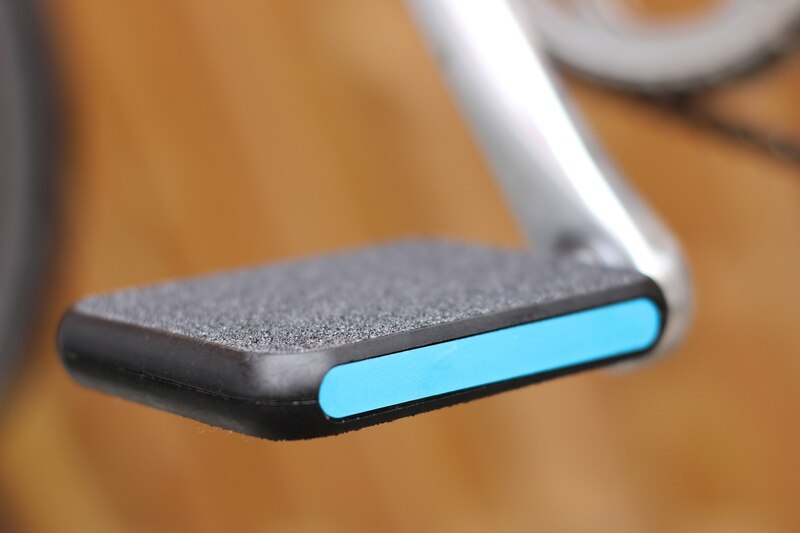 The pedals are significantly thinner, with more surface area most other pedals, which is good. The included 3 mm hex key is not needed for installation, only for disassembly and maintenance. The pedals require an 8 mm hex key. It is not possible to use a 15 mm pedal wrench. 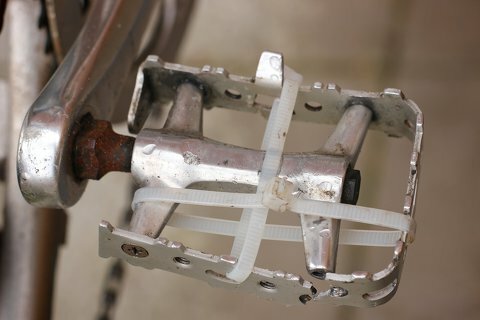 This is common for high quality pedals in order to save weight and allow the pedals to be closer to the crank. 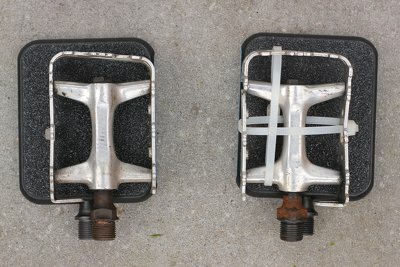 The Moto Reflex pedals have an unique feature where they can be moved up to 5 mm inward or outward, this does require disassembly. In my opinion including the 3 mm hex key is unneeded. Who has a 8 mm hex key but not a 3 mm hex key? Maybe if you have the pedals installed by a shop? But these pedals are sold directly to consumers in a colorful packaging. You can buy a multitool or a set of hex keys anywhere for what these pedals cost. 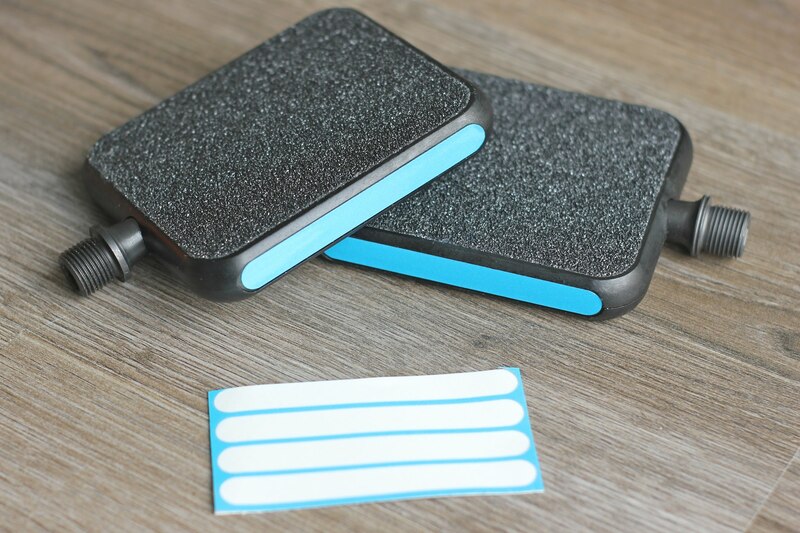 Including some extra reflective strips, grip pads, or some grease for the threads would be more useful. 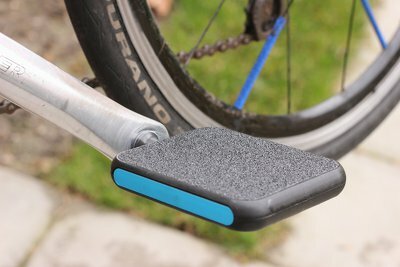 The pedals come without the reflective strips applied. After applying the reflective strips the pedals suddenly look a lot more fun. The pedals come with a leaflet with installation and maintenance instructions. The text is in English and manages to be both oddly specific yet extremely vague. 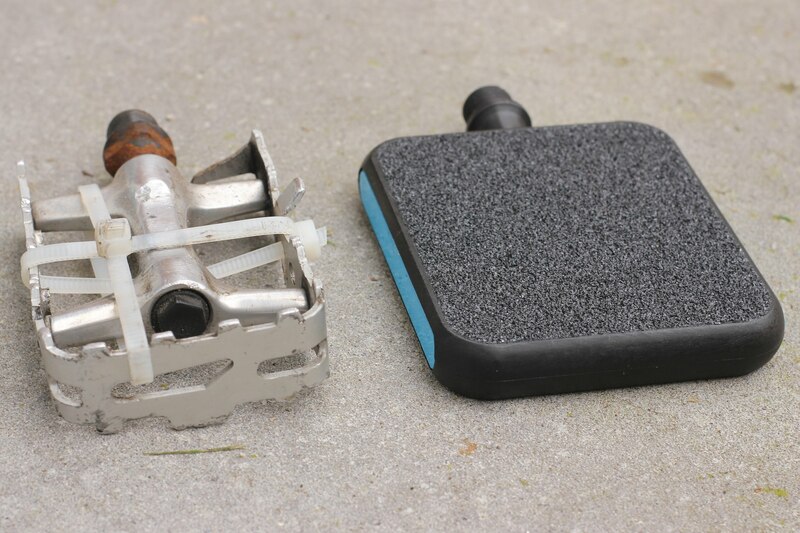 The pedals require maintenance every "few hundred kilometers". I guess few is more than a couple, so three hundred then? Since these are urban commuter pedals, lets assume 10 kilometers a day, 5 days a week. That would be only six weeks! Every six week you need to get the hairdryer from the bathroom, heat the pedals and remove the grip tape on both sides of both pedals. This has to be done carefully, without explaining what to be care for. Cycling tourists better pack a hairdryer, if they are to follow these instructions to the letter they should repeat this process it weekly. After using the hair dryer to remove the four adhesive pads have to remove 16 screws before you can grease the axles with "Berulub FR 16" or anything equivalent, as long as it is silicone free, synthetic, special grease with PTFE additives. Before trying to walk into a shop asking for some "Bear Lube". I tried the internet first. Nowhere can I find any products with this name, only some pictures of yellow barrels with Chinese characters on them and a German website that describes a temperature range and has a very short list, with yet oddly specific yet vague list of example applications ranging from ash trays to kinematic components, which is a fancy way of saying anything that moves. Eventually I sent an email to Moto Bicycles to ask if my PTFE oil would be sufficient. I received no reply. After lubricating the axle, eight screws on each pedal have to be tightened again to 120 to 150 Newton-centimeters, which is a fancy way of saying 1.2 to 1.5 Nm. The manual suggest you can use the provided hex key for that, but omits how that hex key can be used to measure this exact amount of torque. For that you need a torque driver, a cheap one costs about as much as the pedals themselves. the pedals require a 8 mm hex key, one axle has a groove to indicate it is the left pedal. 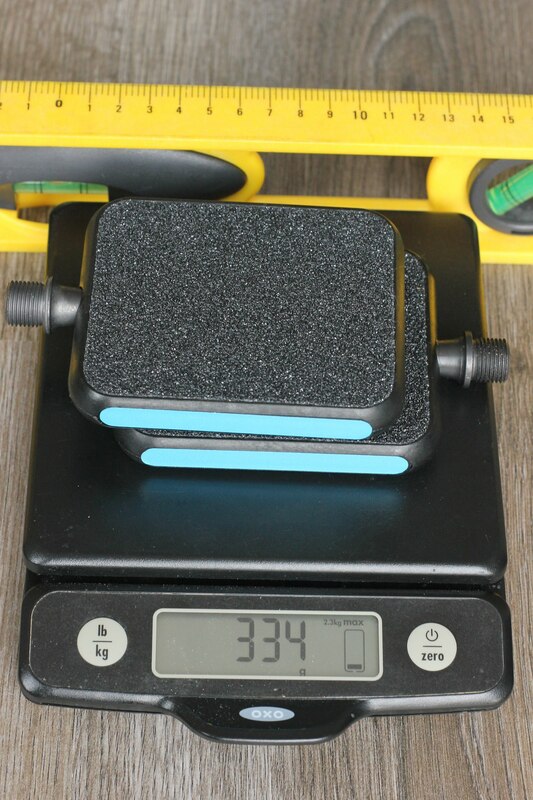 The two pedals weigh 334 grams. I don't know any other bicycle component that has this many screws. The only thing that comes close is disc brake rotors with six bolts, but those are not supposed to be serviced every few hundred kilometers. So, without knowing what lubrication to use and the prospect of using a hairdryer and tightening 16 screws every 6 weeks, I will probably just ignore it and ride them for however long I feel like it. The hardest part of installing pedals is always removing the old ones. In this case they were quite stuck. I used a pedal wrench and a rubber mallet. This works better than trying to turn a wrench by pushing or pulling, hitting it with something will send a shockwave through he wrench that is much more effective for loosening something that is stuck. The left Moto Reflex pedal has a groove around the axle to indicate that it is the left pedal. I applied some anti seize paste to the threads and screwed them in. Since this bicycle is used in all weather I also filled the hex sockets with some petroleum jelly to keep rust and other stuff out. The Moto Reflex pedals have a significantly larger platform than most pedals. 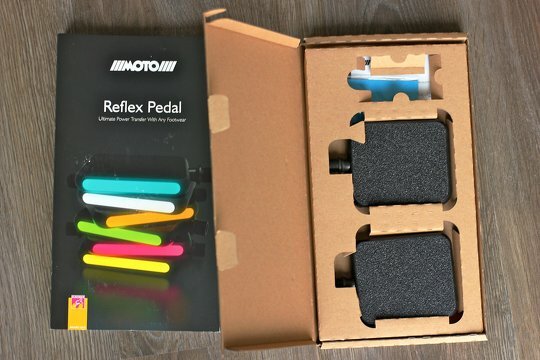 The Moto Reflex pedals are significantly thinner than most platform pedals. Moto Reflex pedal installed on the left crank arm. Moto Reflex pedal installed on the right crank arm. The stiffness of the pedals is not so noticeable while riding. What is noticable is the incredible amount of grip. The feeling of my feet on the pedals is very close to that of using clipless cycling shoes. There are no pressure points on the pedals and there is no twisting or sliding. However, I am sure the grip will degrease as the grip pads wear out over time, so the real question is how durable they will be. There is no noticable bending of the plastic, there are no noises coming from the pedals. The wide platform give more space both inside and outside to place my feet. I wear size 44 (euro) / 10 (US) shoes. The shorter axle allow me to place my feet closer to the cranks than before. This allows for a smaller Q-factor. I tried cycling with my feet closer together, but did not find it more comfortable. This could be due to familiarity, so I will see if that will change. Even with my feet about 10 mm from the insides, the outside of my feet still feels secure. When trying to tilt my feet outward I do not feel like they go over the edges. There is no need to move the pedals further out, at this point, which is good when the bicycle is folded it would be better for the pedals to stick out less. At this point I feel like I would maybe have preffered a slightly smaller a lighter version if it had existed. more experiences will be added to this review once I have used the pedals more. I have not ridden the pedals enough to come to a conclusion. I hope that it will turn out not the be necessary to follow the insane maintenance instructions to the letter. Update July 2017: I have used the pedals almost daily for about five months now. The pedals now spin more freely around the axle, like they are supposed to. I have not opened them up or done any maintenance on them. I recently jabbed my shin on a pedal quite hard. When I did this with the old pedals I would bleed, now there was only a small bruise. When riding the pedals are not noticable at all, which is a very good thing. There are no sounds, and I never worry about slipping off. The grip is still great, there are no obvious signs of wear.